Layne, here is my question. Normally we drink whey, post-workout, and when we do cardio afterwards, it would be cool because we drink whey protein. But what about morning cardio? How long should we do it ? Is there a max. i mean cardio on an empty stomach, after waking up. I don’t want to lose muscle so..
Layne: I noticed on a recent thread you mentioned that you do a mixture of HIIT and lower intensity cardio. With all that HIIT has going for it, why do you keep the lower intensity stuff in there as well? My current goal is to lose fat, while retaining as much muscle as possible. i want to plan out my cardio accordingly. to best fit my schedule. usually it is easiest for me to do my cardio immediately following my weight training. with work and everything it is hard to get to the gym for 2 seperate sessions. How much of a disadvantage am i putting myself at, as far as losing muscle goes, by doing my weights and cardio at the same time? is it worth making drastic schedule changes to seperate the two, or can this way be effective? and finally if i continue to do cardio immediately following weights, should i use hit style, or stick with a longer low intensity? post workout shake after weights, before cardio, or after the entire workout? If we keep our cardio at the fat burning zone(130) for 30 minutes, is there an average amount of calories we should be looking to burn?I do cardio after my workout… should I drink my post-workout shake right after weights and before cardio or after both weights and cardio? On that note. I constantly see people going so slow on cardio trying to maintain ‘the fat burning zone’ b.s. Hell they’re not even working working up a sweat. By the way most those people are over weight. At a higher heart rate you do infact burn some carbs for fuel, but you also burn fat. If you look at the amount of calories burned at a higher heart rate, you’ll see that you burn more fat calories in a shorter amount of time than strolling along. Also part of doing cardio is to stimulate your cardiovascular and central nervous systems. This happens at a much greater capacity at higher heart rates. Plus you get the added benefit of having your metabolism of overdrive for up to 24 hours (according to a study I read in Runners World Magazine). cardio is not catabolic, that is mythical nonesense. In fact, we find that in diet studies just walking 1 hour per day dramatically improves muscle retention. Now obviously these people dont’ train with weights but still, it’s obvious that cardio is NOT catabolic like these cardio phobic trainers would have you believe. My main goal (currently), as I mentioned before, is to cut bodyfat. Should cardio be performed at low intensity or high intensity? I see Dave Palumbo’s recommendations for long duration (45-90 mins), low intensity cardio on these boards a lot. However, if I read the fitness magazines (vice the bb’ing ones), they recommend doing short duration intervals (1 minute 90-95% max HR with 1-2 minutes rest between intervals, and 5-10 intervals). I am also curious how you recommend calculating max HR? The most common method is to subtract your age from 220 and take a percentage of that number. I have a friend who is a triathlete who swears that finding your resting HR and using Karvonen’s Methodis more accurate since it takes into account individual variances and heart health rather than just a generic one size fits all calculation? 3) it increases the activity of the enzymes in the mitochondria. So because of 2 & 3 you actually increase your CAPACITY to burn fat, as well as the rate at which you burn fat; even at rest. 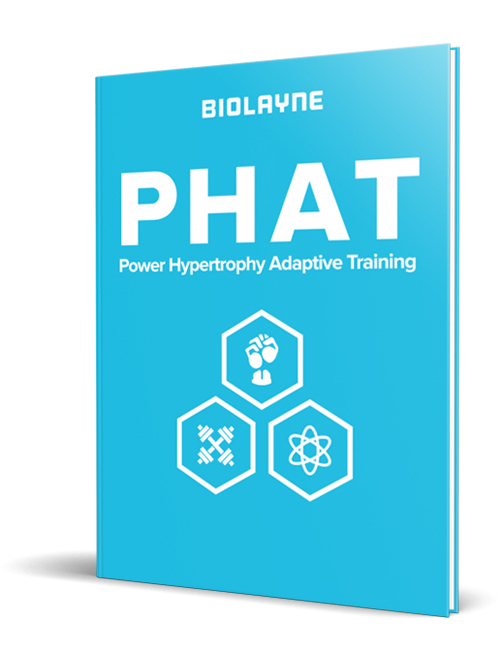 What sorts of HIIT training time periods would you suggest if you were going to supplant the standard cardio for weight loss? How many? I typically do spinning classes (40 min) that have several periods of max output. Also, I like to roll (wrestle/jiu jitsu). 3-5 min intervals. I might place Lower B on day 6 depending on recovery rate.I have also seen you do the “Power Clean” cardio of 10 x 3 with little rest…..do you suggest that? what would you advise eating after HIIT? Same as weights or different? Precontest – do you do HIT cardio ONLY on your off days and then lower intensity cardio on training days and after leg day? Is HIT ok to do on a bike? Also, is there anywhere that shows a decent protocolfor HIT cardio? I was thinking like 1min sprint/30sec rest, that okay? Yea it’s ok on a bike. But you cannot sprint for 1 minute. A sprint should be ALL OUT, you cannot go all out for one minute. 20 seconds is probably around a max. I’m not talking simply about going faster than usually, i’m talking about going as hard as you possibly can; not looking at the clock, i’m talking about moving like your f**king life depends on it. Try starting out at 45 sec low intensity followed by 15 seconds of sprinting. If you go absolutely all out for those 15 seconds i garuntee after 10-15 intervals you will be toast. By the way, while you do your HIT cardio, do you bring the shake and like sip it during the low intensity periods? Ok, I’ve been doing the cardio post workout in order to try to stay leaner this offseason, will the WMS complex interfere with this due to the insulin spike before cardio… or will it not matter? What do you think of max-ot cardio? 16 minutes overall a session, 1 minute intervals going all out for 1 minute and easing up for a minute always working to beat your previous time? It’s very intense. Also post cardio nutrition, should you eat right after completing cardio? I always think that eating right after cardio might be cutting into an residual fat burning that might be taking place after a cardio session-sorry, I guess that’s 2 questions. Intervals are good, but you can’t go ‘all out’ for one minute. You will pace yourself with that long. You are better off sprinting for 10-15 secs then resting for 45-50 secs then doing it again. A sprint by definition is ABSOLUTELY ALL OUT EVERYTHING YOU’VE GOT and you can’t do that for 1 minute. Also, eat after cardio. okay so i will train in the morning a Layne huge question for you. I started the max OT training progam if you are familiar with it, it calls for cardio at 16mins at a high intensity. They say to do this cardio 3-5 times a week. I was planning on doing this first thing in the morning before eating on my treadmill. Im planning on starting at 6.0mph then working on increasing my speed each session. Do you think this is effective for fat burning? and then do max ot cardio in the nights 3-5 times per week at 16mins. do u think that will get the job done? Or do u tink it should be 30min sessions? can u give me a example of what a 16min high intensity cardio session on a treadmill would look like for yourself? such as mph intervals, inclines, etc. I read somewhere that you sometimes do hill sprints for HIIT. What are some of the other types of cardio that you enjoy for HIIT? Just trying to get some more options to shake up cardio for my HIIT sessions. Also, how long do you usually go? I was thinking 15-20 minutes for around 1 min intervals (or as long as I can go at 100%, maybe only 15 seconds)! Do you ever do jog/sprint/jog for your cardio HIIT? Myself, I like it, but just make sure I distance it from my direct leg training to maximize recovery. Would be interested to see if you incorporate it into your cardio. Would 10, 100yard sprints on a track (running straights and walking corners) be good HIIT? and do you consume bcaa’s when doing hiit? How do you plan your eating around h.i.i.t.? how many times a week do you recommend h.i.i.t cardio for bulking/cutting? would you perform weights and h.i.i.t cardio in the same day or on separate days? I do it on my offdays during bulking; I may increase it for cutting if need be. If I do it on the same day as weight training I try to seperate them by a few hours if I can. In the offseason I treat HIIT just like a workout & eat accordingly. Ever since I switched my cardio sessions to the day after my leg sessions (2x per week), I’ve noticed a pronounced difference in soreness (much less sore). Even with H.I.I.T. repeated bout effect, it’s great. Hey layne, how much do u drop calories on cardio only days when bulking? If I lift 5 days a week and do cardio ( 30min LI walking at a incline) on 2 days, how much lower should calories/carbs be? What is your opinion on the G-flux from Berardi – simplify: very high cals 3.500-5.000/day and weekly 10+ hours activity (3 weights, 2-3 HIIT, 2-3 low int. cardio etc.) the “secret formula” to be lean all year… I proved it but after 1-1,5 week I was very tired on the afternoons (I train in the early morning) and my weight went up with 2-2,5 kgs (and not all was muscle…) so I stopped. I think high activity is a good idea but I think low intensity cardio is a very bad idea. Low intensity cardio has no metabolic benefit. High intensity cardio does. It increases mitochondrial density and activity giving you a greater capacity to burn fat at rest and thus keeping you leaner even when calories are higher. Talking with a guy at my gym, he told me about the way his trainer has him doing cardio at the moment. I’ve done it before, not for any specific reason but just to mix things up. I was wondering if you had a scientific opinion of it. Seems to make some sense, except that, at high intensities, the preferred source of fuel would be glycogen, no? Curious on what you think. As much as people would like to have you believe that glycogen is the only fuel you use during high intensity that is non-sense. This is the problem with ‘gurus’ who know a little bit, they know just enough to be dangerous. When doing the 4 week bulk, 2 week cut diet, is cardio performed just during the cut or throughout? |What is some good HIT to perform? Also, how often do you do perform it and for how long? I perform High intensity throughout. My current favorite high intensity is doing sprints with my sprint parachute. It really depends, but I do 2 days per week for 10-15 minutes of intervals. Is this your protocol for wind/parachute sprints as well? With respect to cardio and carbs Layne. would it differ depending on type of cardio? ie. high intensity would require more carbs compared to ss low intensity not really requiring carbs for the fuel? or is this a bb myth too?? I know you advocate quick switches between bulks and cuts, going from (for example) 2500kcals to 3500kcals one day to the next….but you advocate a very slow upward taper post contest, going up less than 500kcals a week…. why the different strategy? Because there’s a HUGE difference (metabolically, hormonally, etc…) between dieting for months and being 3-5% (not to mention way below setpoint) and dieting for 2 weeks and being at or over setpoint.